***I received the following product through Tomoson, in exchange for my honest opinions. All photos contained below are copyright Momma Told Me Blog 2015. Momma Told Me: This is why we don't buy nice things! When I was about 10 I saved up for my very first GameBoy. I took out the trash, swept the patio, did the dishes, and vacuumed the house for 6 whole months, at $3 a week. In the end my grandmother contributed the rest for my birthday gift that year. The GameBoy Pocket had just been released, but I was strictly forbidden to spend money on any device so new, let alone one marketed towards children and intended to be portable. None-the-less, I remember walking out of that Game Exchange with my head held high, beaming of pride, and showing anyone within earshot my fancy new to me, used, GameBoy system. Exactly 13 days later, and, I recall the number of days because Momma would later repeat it every time I so much as glanced at a portable gaming system for the next decade, I allowed my pride and joy to tumble from the back seat of out family's mini van face down onto the pavement below. An incident that today would seem quite harmless, but to a behemoth of a handheld like a classic GameBoy meant a cracked LCD screen and the end of a beautiful relationship. In all $55 had been spend on that handheld gaming device, and Mommas was not about to let me forget during the remainder of my adolescence. The original GameBoy was release with a market price the equivalent of a modern day $170- Today most new smartphone generations average over $500. I needed remind you that smartphones are used far more heavily than any portable gaming device- heck, they double as gaming devices, and GPS systems, and veritable tablets. We, as a society, are more and more attached to our smartphones every day. So, when we buy them we slap a case on it and a thin piece of plastic we call a screen protector. Unfortunately, I, personally have seen 4 Galaxy S4 or higher phone models meet their end with a shattered screen, while wearing one of these supposed screen protectors. 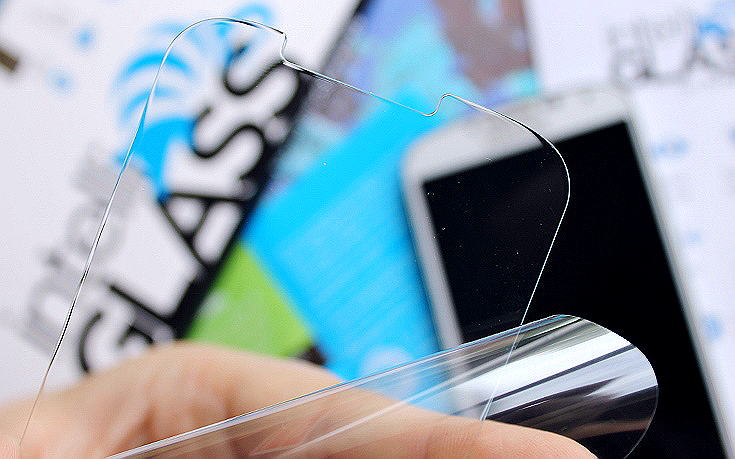 What are you really protecting your phone from with a plastic sheet? 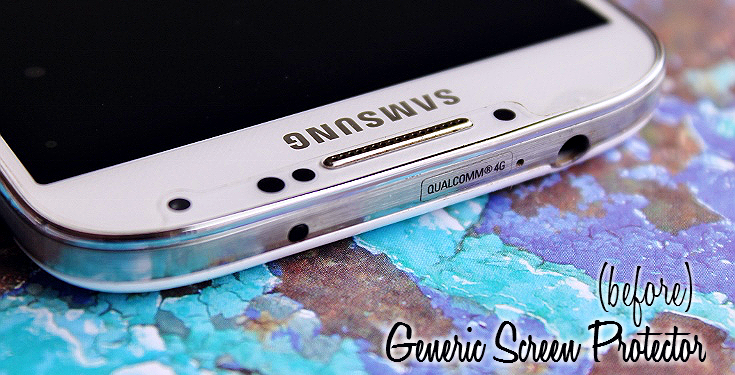 A replacement screen for any smartphone 2-3 generations recent runs more than $100, with installation. That's a hefty chunk to pay for a device you were likely already saving up to replace! 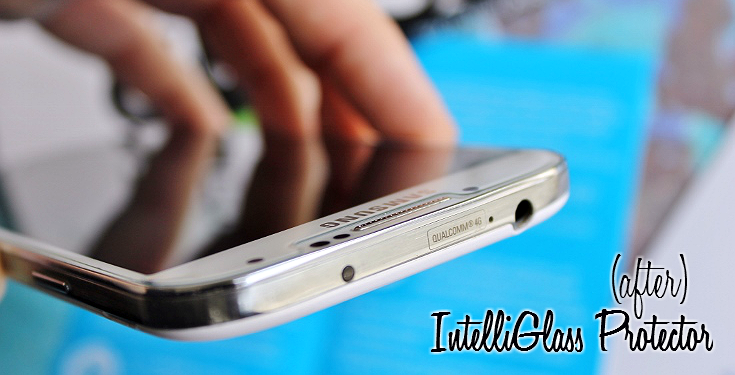 Using a glass reinforced screen protector such as intelliARMOR intelliGLASS screen protector on your mobile device is just plain common sense. Many people I've talked to about 'glass' screen protectors have several reservations. For starters, it's hard to talk someone into spending $20-$40 for a screen protector when they can buy a 3 pack of 'regular' protectors on Amazon for $5. 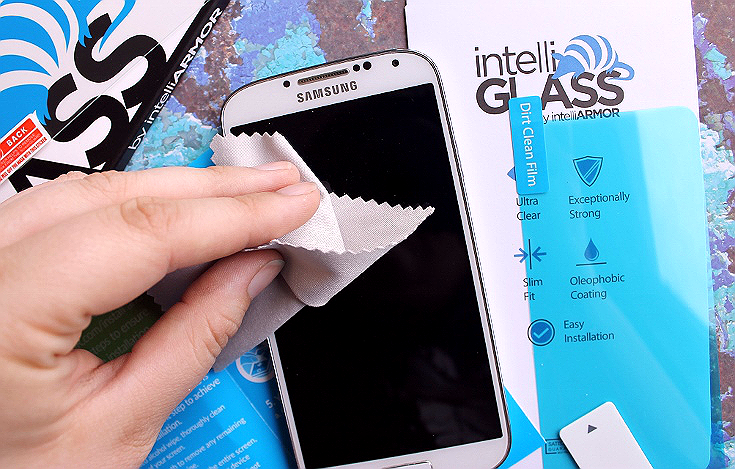 intelliARMOR intelliGLASS protectors are available for devices as recent as the Samsung Galaxy S6 for just $12.95, and include a Lifetime Warranty. 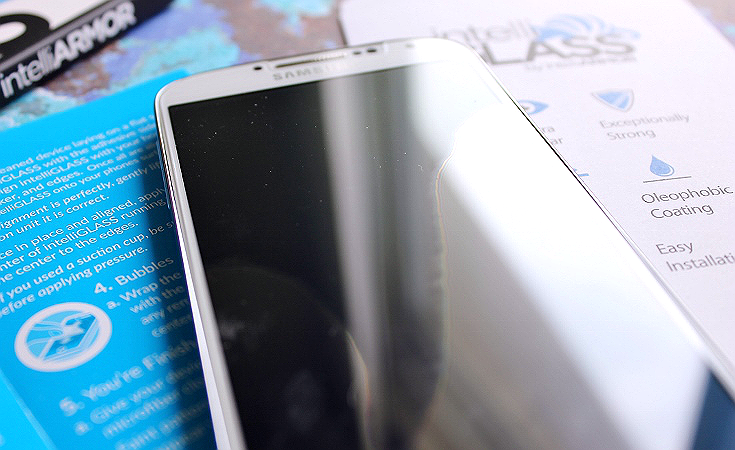 It's important to keep in mind that an intelliGLASS screen protector is intended to absorb scratches and harsh impacts to protect your phone's natural screen, and is not promised to be indestructible. That is to say the screen protector will 'take the fall' for your phone when it really matters- should the fall prove untimely, simply submit a warranty claim for a replacement screen protector. The next concern I hear a lot is the ease of application. People often hear that glass based protectors can shatter or break if not installed properly, or worry that the installation process is simply too involved to do themselves. In this post I've given you a visual breakdown of the easy steps to application. 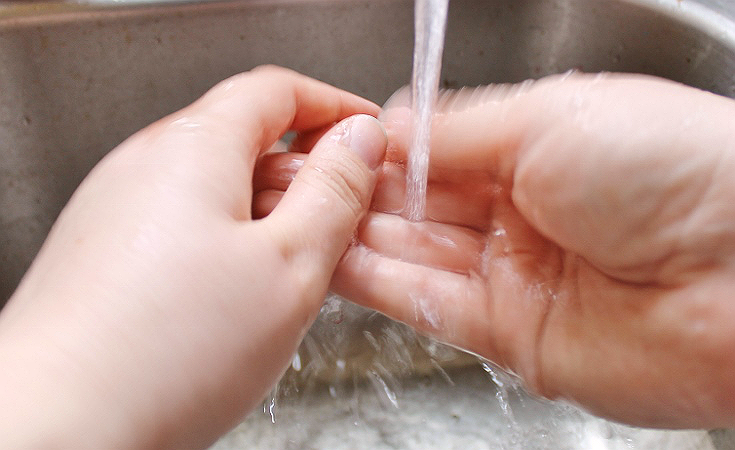 Clean your hands and your work surface thoroughly to start. 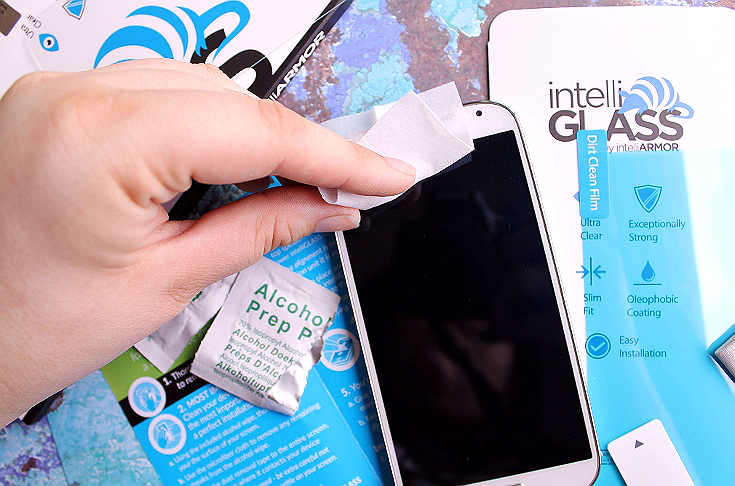 The intelliARMOR intelliGLASS screen protector includes a kit with everything you need for application. 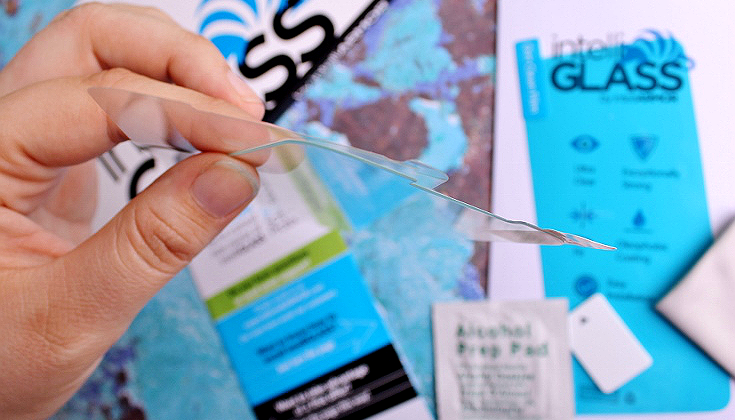 Use the included alcohol pad to remove any residue from previous protectors, dust, or oils. 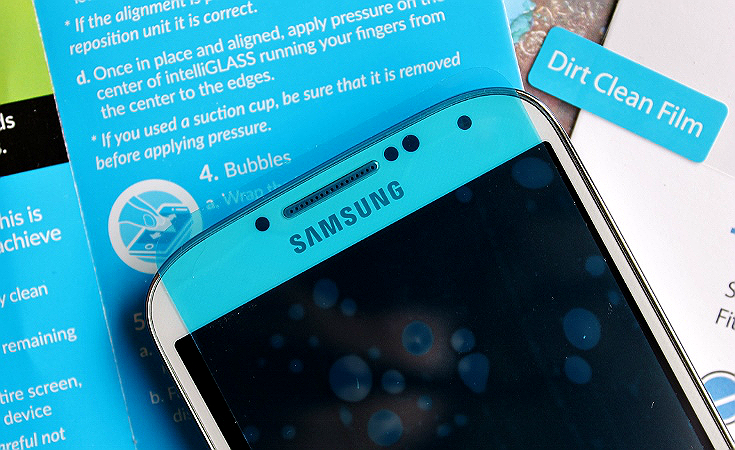 Place the 'Dirt Clean Film' on the clean screen surface and remove any finite, invisible, dust and specks. Next, remove the backing from the intelliGLASS screen protector and position it above the screen- slowly lower it into position. 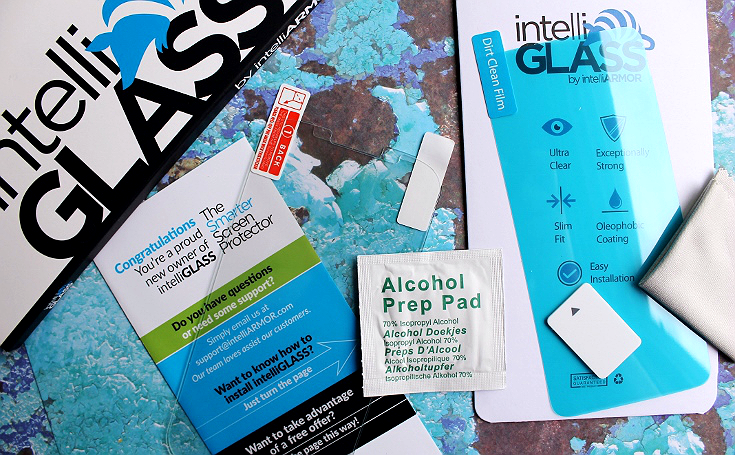 Watch in amazement as the intelliGLASS binds itself to your phone, all air bubbles and pockets rushing out towards the edges as it adheres and seals. 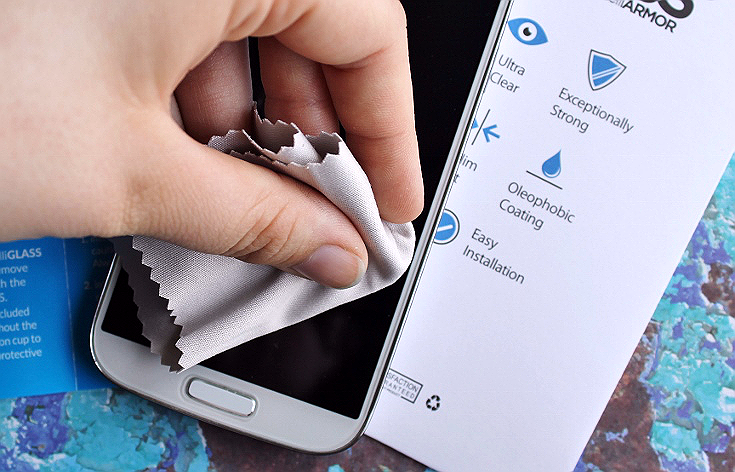 Use the included screen wipe to smooth out the intelliGLASS for good measure and admire your slick new, armored screen. Application couldn't be easier and, in my opinion, is simpler than traditional screen covers that tend to bubble and require repositioning. If you're concerned about the intelliGLASS being too thick, I've found no disruption with multiple styles of modern smartphone cases for my Samsung Galaxy S4. In fact, let's talk a little about how it does feel- because that is the FIRST thing people notice when they pick up my phone. The screen is noticeably more responsive, thanks to the oleophobic coating which repels oils and keeps your touch gliding even and smooth. I daresay it feels as good as, or better than, my devices natural 'naked' screen. 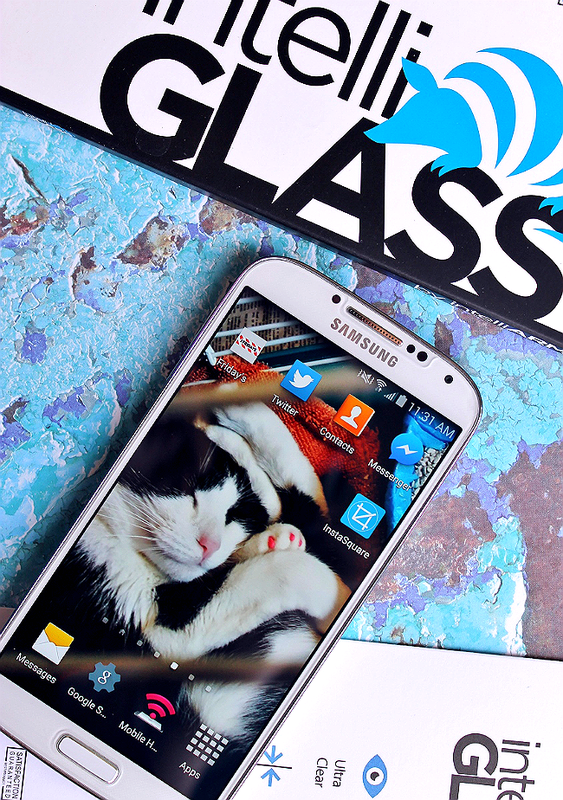 And, if you're concerned about safety, the intelliGLASS screen protectors feature a lightweight glass 'core' wrapped in a shock absorbing outer coating which prevents dangerous loose shards and pieces should the protector crack upon impact. I've been using my new intelliGLASS screen protector for a week now- and my father has already gone through a 'cheap' imposter he got on Amazon. Don't be fooled by other protectors with 'glass' in the name, they are not all created equal. 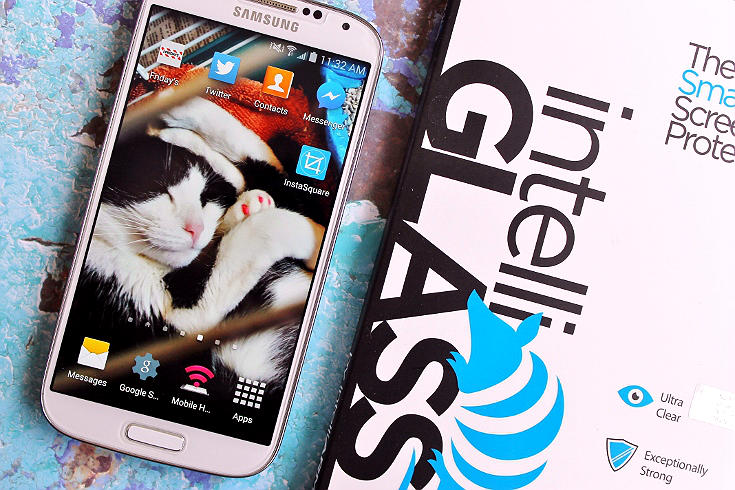 My only regret with #intelliGLASS has been that I didn't invest in one sooner- my smartphone's usage experience has been enhanced greatly by the touch and feel of this wonderful phone armor device, and I'll likely be gifting several this holiday season! Have you ever lost a phone or mobile device due to an unfortunate mishap? 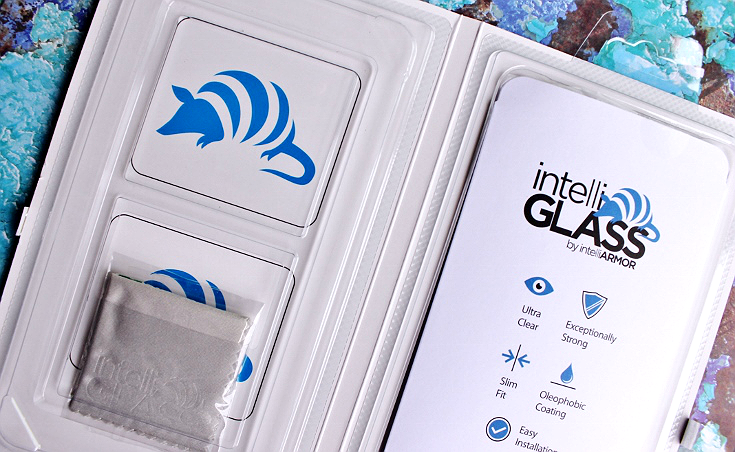 Save 20% on your intelliGLASS purchase now with promo code intelli20. What Daughter Says: Protect your investment while enhancing it's experience- choose intelliARMOR for mobile devices. One Momma Told Me reader will win an intelliARMOR product of their choice.